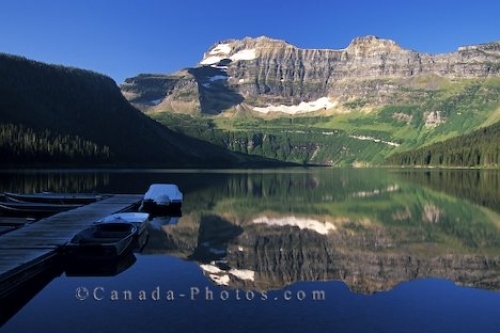 Cameron Lake is a sheet of glass in the early morning in Waterton Lakes National Park in Alberta, Canada. The serene surroundings of Cameron Lake in Waterton Lakes National Park in Alberta, Canada creates the perfect setting for a scenic picture. The Southern region of the Rocky Mountains reflect in the calm waters of Cameron Lake as the blue morning sky shows promises of a beautiful day at Cameron Lake. Picture of Cameron Lake in Waterton Lakes National Park in Alberta, Canada.